Onboard DVR vs. Runcam Split? 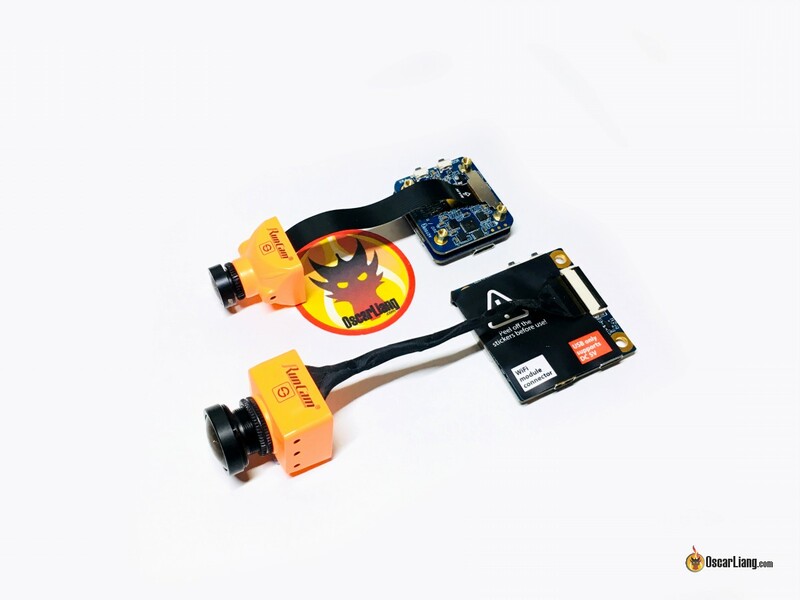 The Runcam Split is an FPV camera capable of recording HD footage at the same time. There are two popular choices which I have tested, I will explain the pro’s and con’s of each one in the rest of this article. The HMDVR-S is a lightweight and compact onboard DVR solution, which is perfect for mounting on a quadcopter. By removing the case, we can reduce the weight down to only 2.3g! You can probably use it on a Tiny Whoop :) But flight time will be shortened greatly due to its high current draw. I tried splitting the video signal from the camera and feed it to both the DVR and VTX, and it worked perfectly. Some people suspected that splitting the video signal form the camera might reduce image brightness, or even the image quality overall. But I went back and forth many times and I didn’t notice any difference before and after splitting the signal. I also tested a few different cameras just to be sure, the results are all the same, no change to image quality and brightness. I tested the Runcam Micro Swift 2, Caddx Micro SDR1 and Foxeer Micro Predator. However, there is vertical cropping in the recorded footage with the HMDVR-S. As you can see from the following screenshot, the bottom part of the image is cropped (on the right). I am not sure if this is a generic issue, or just my unit. 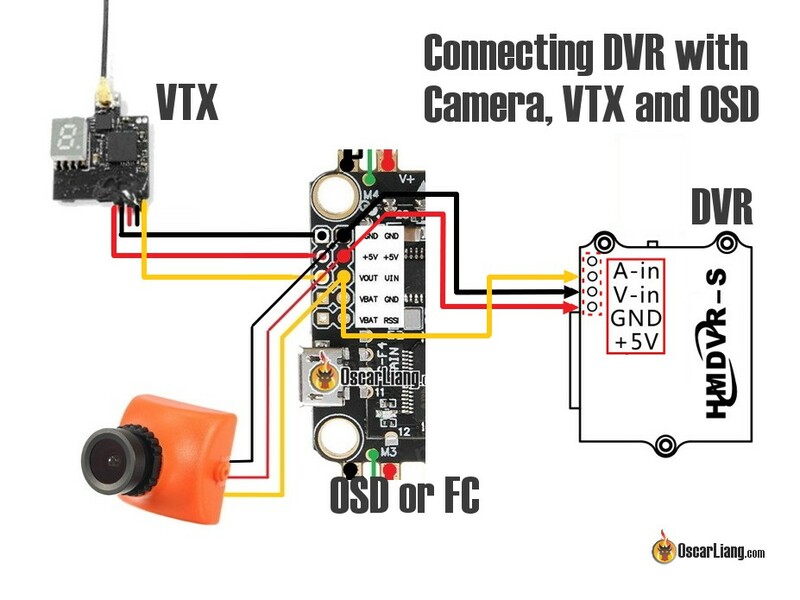 Because I am using Betaflight OSD on a flight controller, and I don’t want to have OSD in the recorded video, this is how I connected the DVR, FPV camera, VTX and flight controller. If you want to keep the OSD, you just need to move the V-in of the DVR to the Vout on the FC. The ProDVR from Eachine is bigger and heavier than the HMDVR-S, it’s clearly designed for ground recording primarily but still feasible to be used on a multirotor. The ProDVR has video output so you can avoid splitting the video signal from the camera in case that causes any problem. However, that’s a NO GO for FPV, the latency is simply too high at 63ms (excluding latency from FPV camera). Luckily, when I split the video signal from the camera to the ProDVR and VTX, I didn’t notice any ill effects to the image brightness or quality at all. So you should be able to connect it this way in your mini quad. This is designed to be mounted in a 20x20mm stack. It has user-friendly solder pads and and SD card protector. Check out my full review of the Runcam Mini DVR module. There is no perfect DVR at the moment and they all have their pro’s and con’s. I hope manufacturers can come up with a DVR for FPV that addresses all the problems we mentioned. Right now, the Runcam DVR is my go-to option for a mini quad because of how easy it is to use. I would have chosen the HMDVR-S, if only it didn’t have the cropping issue. It’s also the smallest, lightest and cheapest on the list. It’s still a good DVR if you don’t mind the cropping. However, you are unable to change settings on both of these options, and they drop frames between files, which can be bothersome. If these are you concerns, you should consider the ProDVR instead. For ground recording I would definitely recommend the ProDVR because it has high resolution and bit-rate, you can change settings, and it offers more flexible connection. Are there any DVRs that auto-save when power off, auto-record when power on? I want to try night flying with a Runcam Night Eagle but want on-board recording. No onboard DVR does that unfortunately. Oscar is seems you didn’t encounter the darkening of the image that myself and a few others have? I tried different grounding locations and points of video signal to no satisfaction. You think I just got a bad one? Do you think the firmware upgrade would help? I know it’s for cropping, just throwing ideas out there. Is it possible to show the battery voltage on the Monster Pro screen or your video is from the FC OSD? My Monster came with the light purple wire but the VSEN mark was removed even though the pin is there. it’s from FC OSD. but it should be possible to use the VSEN pin. with an Iflight IH3 pro (revobee mini 32K f4 FC) I had just bought. custom Betaflight firmware with MSP turned on in UART1). board) is not usable for dsm2 because of it Sbus nature. there is no UART3 pads on the board. assume its for controlling a rgb led strip), but did not worked. (remaping worked fine, but betaflight still can´t see rx signal). receiver on this damm board!!? I will really apreciate any suggestions! I have a bit of a problem with the hmdvr-s. I wired but i noticed an huge drop in the fpv range and a drop in luminance. The picture is ok but with the range drop it is a shame. Any thoughts? This is an excellent idea! It has me thinking that I could use the same technique to add an internal DVR to my attitude v3. It’s the only thing that I wish they had. How does the Runcam Mini FPV DVR (not to be confused with the Split Mini)? It has a 20x20mm mounting and installs inline between the camera and the VTx/FC and weighs less than 4g. I mean, “How does the Runcam Mini FPV DVR (not to be confused with the Split Mini) compare? It’s coming to me, will test it out. I recently got a HMDVR-S to put on my Babyhawk-R and the recorded video has dark and light banding pretty bad. There is no trace of these bands in my goggles or on my 7″ screen with the live video feed. After a few other tests I took the unit out and have it connected straight to a camera and power with nothing else involved (no quad – fc/motors/escs) and the video looks much better. Is there any way to condition the 5v power for this unit when every gram counts? The quad already has a capacitor at the battery leads but that isn’t cutting it. It even has the banding then the motors are off. How about using one of those cheap $12 iMars cameras they sell on Banggood? They seem like a good Go Pro alternative. I’m not sure about their quality. They are worse than what we see on the FPV camera TBH :D and they are usually heavier than a DVR, and extra battery you need to charge? Hey oscar did you know theres a wire interface to control the recording on the eachine dvr? The betaflight devs said you should be able to program betaflight flight controllers to start or stop recording the dvr on arm or disarm. I think its also possible on the hmdvr with a small hardware hack of some kind. I was looking at the DTX03 as well as the cyclops one, but most of the reviews of most of the FPV camera with built in dvr function had pretty substantial delays in FPV signal (runcam split excluded). Great review / article on how to solder things together, I’m going to setup a hmdvr-s, vtx03, and a caddx micro SDR1, micro predator or so my Leader120. Re: Cropping…. Were you using a PAL camera by any chance?Could it be that the camera is outputting a PAL signal (i.e. 625 lines) and the DVR is recording only 525 lines (i.e. NTSC)? That would account for the bottom 15% crop. Just a thought. At least for the Eachine ProDVR there is a firmware available at the RCGroups that fix the cropping issue, you just need to make sure to power the camera first and then the DVR, not sure what will happen in this case since both will be plugged in exactly at the same time.. I don’t have cropping issue with the ProDVR, just the HMDVR-S. When you’ve installed the DVR in the quad, not sure how you can power one thing after another … that’s tricky.